Because all bloggers have essentials that they need to survive. Or to, y’know, look all fancy. An iPhone charging pack. How else will I scroll through instagram for 6 hours? What if I can’t find a plug? That’s why everyone needs a portable charging pack – I got mine from amazon and it holds three full charges. Everyone always ends up getting one after they borrow mine, because so handy! This one is much smaller than other ones I’ve seen as well. Hand sanitiser and hand cream because ew, germs and ew, dry hands. My favourite hand gels are the bath and body work ones, but any will do. My favourite hand cream for in my bag is the Roger & Gallet one because it’s not at all sticky. MAC Fix +. Nothing is quite as refreshing as this, and it’s so perfect for a mid-afternoon makeup refresh. Business cards. If you won’t promote yourself, who will? I have blog business cards and work business cards – I don’t like giving them out because I feel like a bit of an idiot, but you (and I) should shout our blogs from the rooftops. Hair ties. Nothing worse than suddenly suffering from a bad hair situation and not being able to tie it out of your face. Perfume for when you want a freshen up. More brands need to do rollerballs, please. I love the YSL Black Opium, and use the rollerball (which my mum v kindly brought over from the states) quite a lot. Lipbalm and lipstick options. I need so many options, and I start to panic if I have less than maybe 3 balms in my bag at any given time. Even though I’ve got two on my desk. You know, just in case. Blotting papers and compact powder. Blotting papers are the best! So good. I love the Too Faced powder compact as well, it’s like foundation as well but doesn’t feel heavy. Notebook and pens. You never know when inspiration might strike, and I need to scribble down all my schemes. Breath freshener / mints. Chewing gum is all well and good, but it looks gross when you chew it (and always in photographs. Just, no) so mints or sprays are my bet. 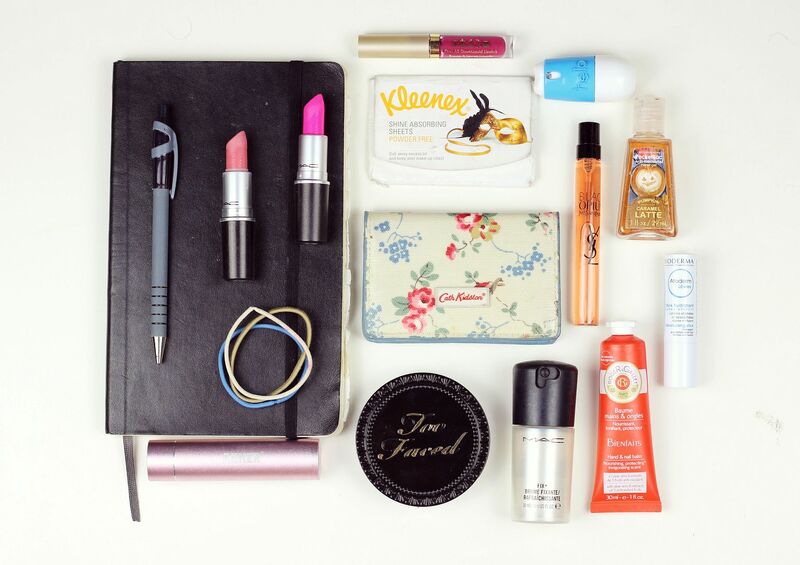 What do you always keep in your bag? If you liked this post, you might like this post on my handbag essentials or this post on my new bag. Five face brushes I use everyday.